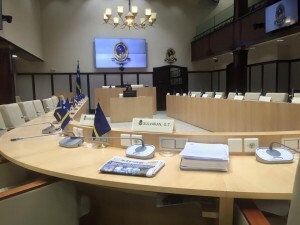 WILLEMSTAD – The new majority in parliament formed by 12 MPs signed a petition to meet with the outgoing Prime Minister of Curaçao Hensley Koeiman in a public meeting. The twelve MPs are concerned about the government’s decision to dissolve the parliament. Also about an international treaty that protects the functioning of a parliament. The President of Parliament Gilmar Pisas already confirmed the meeting which will take place this Thursday, February 23. The MPs are also worried about the pending issues that require immediate attention from the government.